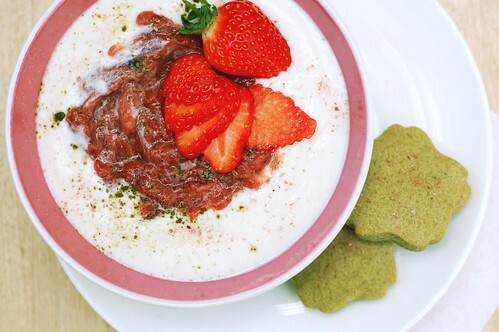 sakura-flavoured soya yoghurt, strawberry compote, sakura blossom/cherry leaf powder, fresh strawberries & matcha shortbreads. Okay, you can tell me. Have I overdone it just a tad on the strawberry/sakura/matcha combination recently? I was trying to make the most of it before Summer was undeniably upon us! And, of course, I've been baking a lot these last few weeks, because it's how I deal with exam stress. Or, actually, you know - well, I bake a lot. Generally speaking, the people in my life are pretty used to this, but I think I must be worse than usual at the moment, possibly caught up in the idea of blogging again. I must admit that in between French revision sessions the other day, Helen saw me sprinkling cherry leaf powder onto my porridge, clutching my camera, and laughed at me. Helen is supposed to be my most supportive housemate. I don't need this, Helen! I don't need you! When I live on my own, I can make breakfasts as weird as my heart desires! The internet will embrace them! I won't be brandishing sakura extract round our kitchen for much longer! There aren't recipes for most of these things, but because I'm on a serious smoothie kick I'll prod you into the following. The frozen banana makes it super cold and creamy (and I'm really not a banana fan generally), meaning that it's pretty much as wholesome as one can feel while drinking frothy pink milk and sitting on the back doorstep. Which sounds quite wholesome, actually. But now with added fruit! 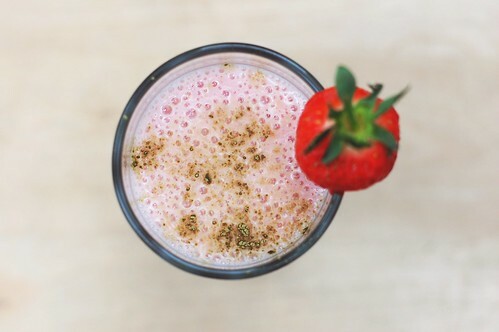 -blend til smooth and frothy (and pink!). I sprinkled with cherry leaf powder, but this is obviously not required smoothie-etiquette. I just have a lot of cherry leaf powder around right now. So you win the award for most creative meal, hands down. I despise bananas but you actually made me want to try it frozen. Eureka! Looking forward to more deliciousness and beautiful pics. Hey, thanks for commenting! Trust me, I used to LOATHE bananas - something about freezing them changes them completely, they've seriously grown on me now. If you've never tried banana soft-serve, that's a good way in; you just chop up a frozen banana and whizz it in a food processor with a little water or milk til it goes the consistency of soft-serve ice-cream. Definitely worth a try! I would love to "chat " with u via email maybe? You left a lovely comment to me on PB&Jenny before (re underweight issues). If you are open to chat via email that would be lovely. I sent you an email, but not sure if you received it? Can you PLEASE post some sort of recipe to follow for the shortbread matcha cookies and non dairy icecream, along with the oatmeal and compote?? Hey anon! For the shortbreads I followed basic proportions; 4oz butter/vegan margarine, 2oz caster sugar, and 6oz plain (all-purpose) flour, along with a Tbsp or two (don't remember, sorry!) 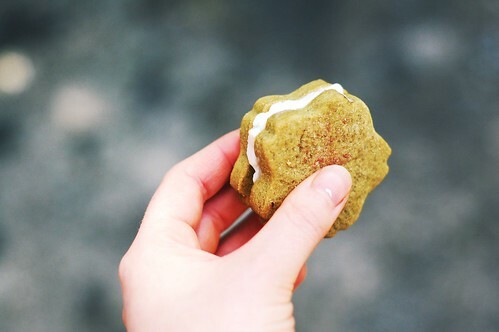 of matcha green tea powder - beat the margarine & sugar til smooth, then mix in the matcha flour; shortbread's best made with the fingers, til it comes together to a dough. Roll out on a floured surface, cut into rounds or whatever you fancy, and bake at 190C/375F until the edges go golden-brown - time will depend on how big or small they are; these little ones only took about 10mins I think? I also sprinkled with a little sakura powder/sugar before baking. The non-dairy icecream was shopbought; I let it get soft, then sandwiched it between two cookies and refroze until just firm, and ate it that way. 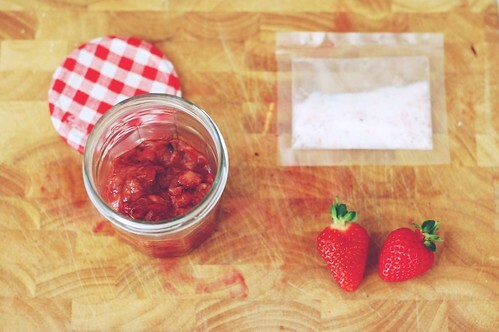 I don't have much of a recipe for the oatmeal and compote - I just halved and roasted strawberries in a baking tray with a slosh of balsamic vinegar and some sakura sugar to taste, then once they were soft and juicy I mashed it a little with a fork, let it cool, and put it in a jar. 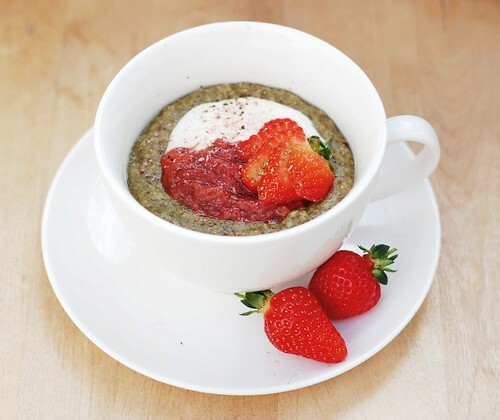 The oatmeal is just made the ordinary way, with a spoonful of matcha powder added; served with soya yoghurt & the compote. Sorry I couldn't be too precise, but I hope this helps!